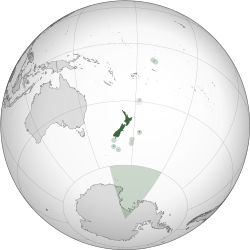 New Zealand (Eng-gí ho͘-im: /njuːˈziːlənd/ "Niu Jí-len-toh"), Māori-gú hō-miâ Aotearoa, mā thang hoan-e̍k chò Sin Se-lân (新西蘭), Liú Se-lân (紐西蘭), ia̍h Niú Se-lân, sī Tāi-iûⁿ-chiu ê kok-ka. Hô-lân ê thàm-hiám-chiá Abel Tasman tī 1642 nî ê sî kā pún só͘-chāi hō chò Staten Landt, goân-lâi sī lia̍h-kiò chia sī Lâm Bí-chiu ê lâm-pêng bóe. 1645 nî, Hô-lân ê tē-tô͘-su kái miâ Nova Zeelandia ("Sin Ji̍t-lân-jia"), che sī tùi Hô-lân ê séng-hūn Zeeland hō--lâi-ê. Té-bóe Eng-kok ê thàm-hiám-chiá James Cook koh kā hō-miâ Eng-gí-hòa, pìⁿ chò New Zealand. New Zealand chit-ê Eng-gí-miâ tī kin-sè khah liû-hêng ê im-e̍k-gí chi̍t khoán sī Liú Se-lân (紐西蘭), chóng-sī nā Tâi-oân-ōe it-poaⁿ sī kóng Niú Se-lân. Mā ū-ê hoan-e̍k ū chiàu New ê ì-sù, pìⁿ chò Sin Se-lân (新 *). Kî-tha Tang-iûⁿ-sek ê im-e̍k-gí koh ū Giû Se-lân (牛西蘭), Sin Siat-lân-tō͘ (新設蘭杜), Sin Se-lân-thó͘, Sin Tī-i-lân-thó͘ (新地伊蘭土), Sin Chek-lân-thó͘ (新則蘭土), Sin Chek-lân-tē (新則蘭地) téng khoán. Ū chi̍t khoán Maori sek ê hō-miâ sī Aotearoa. Chóng-sī Maori lâng tī Au-chiu-lâng kòe hia chìn-chêng sī-m̄-sī ū ēng chit jī piáu-sī kui-ê kin-á-ji̍t ê New Zealand, sī iáu bô kài chheng-chó ê tāi-chì. Khah goân-sú ê ì-sù, Aotearoa sī chí-miâ New Zealand ê Pak-tó. Maori-gí ia̍h ū pa̍t khoán chheng-ho͘ New Zealand chú-iàu tó-sū ê miâ, pau-koat hō Pak-tó sī Te Ika-a-Māui, chheng Lâm-tó sī Te Waipounamu ia̍h Te Waka o Aoraki. New Zealand Tē-lí-ha̍k Lí-sū-hōe ( New Zealand Geographic Board) tī 2009 nî ê sî, hoat-kiàn kok-ka m̄-bat tēng koan-hong ê Lâm/Pak-tó hō-miâ, sòa tī 2013 nî ê sî chèng-sek siat Pak-tó hō Eng-gí North Island kap Maori-gí Te Ika-a-Māui, Lâm-tó hō South Island kap Te Waipounamu. ↑ "God Save the Queen" is officially a national anthem but is generally used only on regal and viceregal occasions. ↑ English is a de facto official language due to its widespread use. ↑ "New Zealand's National Anthems". Ministry for Culture and Heritage. 17 February 2008 khòaⁿ--ê. ↑ "Protocol for using New Zealand's National Anthems". Ministry for Culture and Heritage. 17 February 2008 khòaⁿ--ê. ↑ New Zealand Government (21 December 2007). International Covenant on Civil and Political Rights Fifth Periodic Report of the Government of New Zealand (PDF) (Report). p. 89. 15 November 2015 khòaⁿ--ê. In addition to the Māori language, New Zealand Sign Language is also an official language of New Zealand. The New Zealand Sign Language Act 2006 permits the use of NZSL in legal proceedings, facilitates competency standards for its interpretation and guides government departments in its promotion and use. English, the medium for teaching and learning in most schools, is a de facto official language by virtue of its widespread use. For these reasons, these three languages have special mention in the New Zealand Curriculum. ↑ "2013 Census QuickStats about culture and identity – Languages spoken". stats.govt.nz. Statistics New Zealand. 8 September 2016 khòaⁿ--ê. ↑ "Population clock". Statistics New Zealand. 14 April 2016 khòaⁿ--ê. The population estimate shown is automatically calculated daily at 00:00 UTC and is based on data obtained from the population clock on the date shown in the citation. ↑ "2013 Census – Cultural Diversity". Statistics New Zealand. ↑ 7.0 7.1 7.2 7.3 "New Zealand". International Monetary Fund. 13 April 2016 khòaⁿ--ê. ↑ Wilson, John (March 2009). 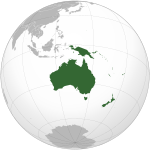 "European discovery of New Zealand – Tasman's achievement". Te Ara: The Encyclopedia of New Zealand. 24 January 2011 khòaⁿ--ê. ↑ Wilson, John (September 2007). "Tasman's achievement". Te Ara: The Encyclopedia of New Zealand. 16 February 2008 khòaⁿ--ê. ↑ Mackay, Duncan (1986). "The Search For The Southern Land". Chū Fraser, B. The New Zealand Book Of Events. Auckland: Reed Methuen. pp. 52–54. ↑ McKinnon, Malcolm (November 2009). "Place names – Naming the country and the main islands". Te Ara: The Encyclopedia of New Zealand. 24 January 2011 khòaⁿ--ê. ↑ Williamson, Maurice (10 October 2013). "Names of NZ's two main islands formalised" (Press release). New Zealand Government. 1 May 2017 khòaⁿ--ê.
Chit ia̍h siāng bóe tī 2018-nî 12-goe̍h 5-ji̍t (Pài-saⁿ), 11:40 ū pian-chi̍p--koè.